On August 2, 1577, the first religious of the order of Saint Francis entered Manila. They were led by father fray Pedro de Alfaro who was accompanied by seventeen religious, sons of the province of San Joseph, of the discalced religious. Thirteen of them were priests, two were choristers and two lay-brothers. Six died on the voyage from Spain to Mexico but they were joined by six more in Mexico. The Franciscans were lodged in a bamboo house, where the marshal Gabriel de Ribera built a church of planks. Father Pedro de Alfaro began his ministry immediately assigning his associates to the provinces, inducing the natives and reducing them to settlements, baptized them and instructed them in the mysteries of our holy faith, and erected churches and laid out villages. Some of the early convents built in Manila by the Franciscans were: the convent of Nuestra Señora de la Candelaria of Dilao, a church and stone house, founded by Don Francisco de Arellano at his own cost, located outside the walls of the city of Manila; the convent of Nuestra Señora de Loreto of San Paloc (Sampaloc), with a stone church and house, founded at his own cost by Master-of-camp Pedro de Gomez. 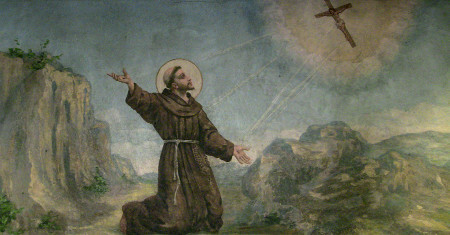 The Franciscans were the second religious order to arrive in the islands, followed by the Jesuits. The first were the Augustinians.